More likely than not, you have not heard of vitamin K. In fact, you may not have heard of it at all. It certainly does not have the high profile of other vitamins. 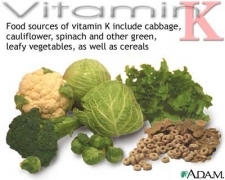 But as more research has been devoted to this nutrient, vitamin K has become a rising star over the last five years. Your Naturopathic Doctor will tell you that vitamin K plays an important role in both blood and bone health. It assists blood clotting (Coagulation). When a blood vessel is damaged, the blood forms clots to prevent blood loss and promote healing. It also helps develop proteins vital for proper blood clotting. It as assists the protein known as osteocalcin, which is crucial in promoting healthy bone growth, repairing bone fractures and helping prevent osteoporosis. The scientific community is increasingly interested in Vitamin K’s impact on some forms of cancer. In a study released last year, researchers at the Mayo Clinic in Minnesota discovered that people who consume higher dietary levels of this Vitamin had a 45% lower risk of Non-Hodgkin lymphoma, a cancer of the lymphatic system involving tumors that develop in a specific type of white blood cell. Do not use Vitamin K supplements without first consulting a qualified healthcare professional, such as your Naturopathic Doctor. If you take blood thinner medications, you may need to closely monitor your Vitamin intake both from diet and supplements. Large fluctuations in your levels of this Vitamin can be dangerous. Discuss medication and Vitamins with your physician or pharmacist. Our Mississauga Naturopathic Doctors at Erin Mills Optimum Health are able to use Intravenous Therapy to assist people in boosting their Vitamins!